How much do the English really care about their stately homes? In this pathbreaking and wide-ranging account of the changing fortunes and status of the stately homes of England over the past two centuries, Peter Mandler melds social, cultural, artistic, and political perspectives and reveals much about the relationship of the nation to its past and its traditional ruling elite. Challenging the prevailing view of a modern English culture besotted with its history and its aristocracy, Mandler portrays instead a continuously changing and modernizing society in which both popular and intellectual attitudes toward the aristocracy-and its stately homes-have veered from selective appreciation to outright hostility and only recently to thoroughgoing admiration. 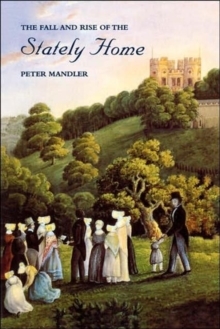 With great panache, Mandler adds the missing pieces to the story of the country house. Going beyond its architects and its owners, he brings to center stage a much wider cast of characters-aristocratic entrepreneurs, anti-aristocratic politicians, campaigning conservationists, ordinary sightseers and voters-and a scenario full of incident and local and national color. He traces attitudes toward the stately homes, beginning in the first half of the nineteenth century when public feeling about the aristocracy was mixed and divided. Criticism of the "foreign" and "exclusive" image of the typical aristocratic country house was widespread. At the same time, interest grew in those older houses that symbolized an olden time of imagined national harmony. The Victorian period also saw the first mass tourist industry, and a strong popular demand emerged for the right to visit all the stately homes. By the 1880s, however, hostility toward the aristocracy made appreciation of any country house politically treacherous, and interest in aristocratic heritage declined steadily for sixty years. Only after 1945, when the aristocracy was no longer seen as a threat, was a gentle revival of the stately homes possible, Mandler contends, and only since the 1970s has that revival become a triumphant appreciation. He enters today's debate with a discussion of how far people today-and tomorrow-are willing to see the aristocracy's heritage as their own.